The band was founded in 1999. Over the years they recorded various songs with different musicians to worshiping oldschool Black Metal. 2003 they used the existing material to create an album, which the band recorded, produced and sold all by themselves. After some years of changing lineup the singer Patrick and the guitarist Holgar from Switzerland decided to change the concept of Lost Shade. Inspired by bands like Bathory, Einherjer and Thyrfing, they agreed on a style-change from Black Metal to a form of Viking Metal. The songs shouldn't be simple and brutal anymore, but more of a thrilling storytelling mix of music and text, without losing a sense of raw and primitive emotions. With this intention in mind they started the songwriting, which took about 3 years, before they were satisfied enough to choose 10 songs for a new album. Patrick and Holgar agreed on investing as much time on every song as was needed to work out every detail and every potential, and even more time to bring all 10 songs in tune with each other. 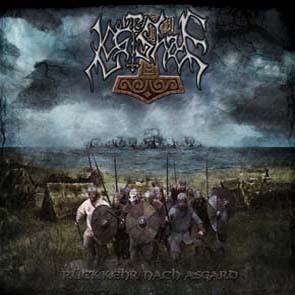 The content of most songs is about the german world of legacys and its myths. Lyrics are about the hard drinking ability of the ancestors ancient wars and battles. Following their intention of the concept of the album, the band assigned the graphic artist Simon Bossert to create a booklet not only consisting of lyrics and informations, but also being a piece of art with 16 pages booklet. The last step towards the recording was the bandjoining of Nico, the bassist. The three of them went into the studio and created, assisted by Connie Andreszka, an album which corresponds to their high demands of creating an entire perfect work. In a new and hopeful attempt they've filled all the open spots in the band and prepare to get on stage in 2010.